I was a little worried last week about my belly not growing at all, but (even though part of it is still bloat, let’s be honest), I can feel that everything in there is definitely growing now and taking more space. I’ve felt it pushing against my bladder several times these past few days. Not a pleasant feeling!!! I don’t know if it’s the baby moving around or if it’s everything just kind of trying to adjust positions to the growing size, but I hate when it happens. I also still feel cramps / pulling sensations every now and then. I thought for sure this was over, but I guess not. 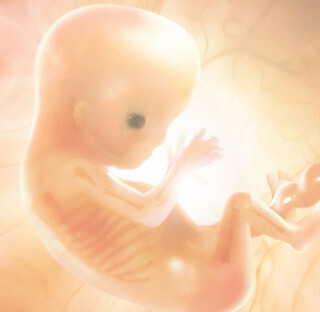 This week’s baby facts: it measures a little over 4cm and weighs 7 grams. If we could touch the tiny little fingers now, we’d be able to feel the beginning of little fingernails. The risk of congenital defects starts to decrease dramatically now, as all vital organs are now fully formed. I have announced the pregnancy to pretty much everyone (I think?). So I’ve now made all my baby-related posts public, as they’d been kept private so far. I still need to upload the rest of our shopping, as I mentioned a few posts back. I guess I’ll do it this weekend!